Manhattan with it's Greenwich Village clubs plus the Lincoln Center are without doubt the epicenter of New York Jazz as we know it, but many people feel that most of the creative music takes place over the bridge in Brooklyn. That view is certainly shared by the Wasserfuhr brothers who were discovered by ACT Producer and founder Siggi Loch playing exactly the kind of thinking jazz that his ACT label is famous for. 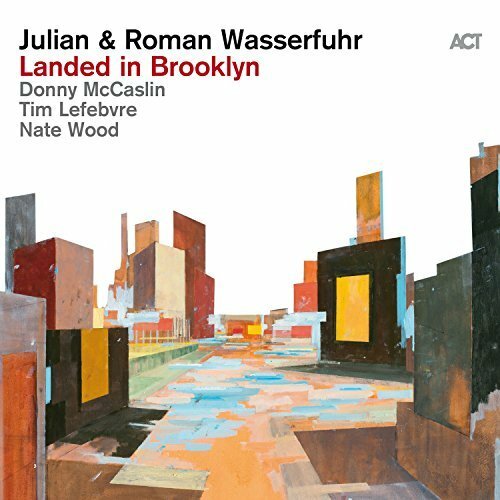 Born in Germany and part of the ACT sponsored "Young German Jazz" co-operative the two musicians and composers now find themselves in the hotbed of Brooklyn as fast rising stars in the contemporary jazz world. Bringing Donny McCaslin into the mix for this recording was a master stroke. Heralded in Europe and America for his work with pianist Michael Woolney and his telling contributions to The Maria Schneider Orchestra he is reconised as one of the major voices on tenor saxophone worldwide. On bass is Tim Lefebre, a player who is equally at home in Rock, Fusion and Electronica as well as Jazz and recently contributed alongside Donny McCaslin on David Bowie's final album "Blackstar" .The quintet is completed by US drummer Nate Wood ex Chaka Kahn, Wayne Kranz, Sting etc and currently also with Michael Woolney's trio. The album itself is a fascinating mix of post bop US modernism and the calming and more refined style associated with the best European players. Most of the tunes are co written by the Wasserfuhr brothers, but things kick off in bright and optimistic mood with the jazz standard "Bernie's Tune". The band immediately sound if they have been together for some time as trumpet and tenor combine well on the theme before reflective piano solo and flugel horn solos bring things to a close. The ballad "Tuto", a memorable and well written tune, is highlighted by the opening trumpet solo and imaginative drumming from Nate Wood. Donny McCaslin joins the fray in earnest for the first time, taking things to the very highest level with a lengthy solo combining brooding low register passages with screaming high note excursions with "Tinderely", an album highlight. The Marimba is to the fore on "Tokyo Hotel" (Durch Den Monsum) before a subdued exchange between trumpet and piano fills a good six minutes on the very laid back "Carlo". The rhythmic train journeys from North to South America are well recalled in the uptempo "S.N.C.F." with the tenor exploration of the Wasserfuhr's theme once again compulsive listening. A portrait of "Ella" is a tour de force for piano after the sensitive horn intro. A rendering of Sting's "Seven Days" takes the listener into a semi fusion mode with electric bass and seaboard introduced for the first time, before the final theme "First Day's Of Dawn" (oddly shown as a bonus track) finds marimba, tenor and trumpet in an intimate and highly engaging three way conversation. This is fine album of contemporary jazz bringing together five masterful musicians in a very successful US / European co-operative.